This article was written on 05 Jan 2019, and is filled under 1920s, Documentary, Industrial, Justice, Labour, Politics, Protest. 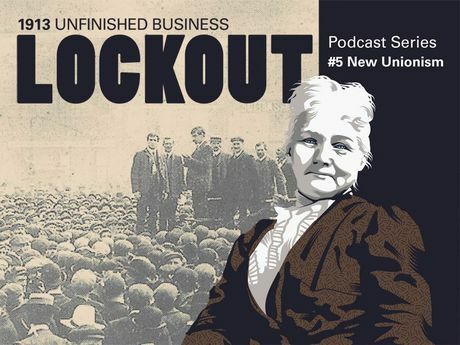 In the latest episode of the Lockout podcast series we look at the development of new unionism at the turn of the 20th century. This was the trade unionism of Connolly and Larkin(“Larkinism”), focused on unskilled workers, that had its roots in the radical working-class struggles of Britain and America. We profile Cork-born American labour leader Mother Jones who was one of the eras most famous trade unionists and a cofounder of the Industrial Workers of the World. Before it reached Dublin in 1913 new unionism had swept across the island of Ireland. The podcast takes a look at the 1907 Belfast dock strike – a cross community struggle of Catholic and Protestant workers – and interviews NUI Galway labour historian Dr. John Cunningham about some of the other flashpoints in the south – Wexford in 1911, the Galway lockout of 1912 and Sligo in early 1913. We conclude by discussing why it is important to see the 1913 Lockout in Dublin in its context, as part of a new international wave of militancy and organisation among workers in the western world. What is the relevance of new unionism for us in 2013? While there are many differences there are also similarities – the rise in unemployment and casual labour; the ossification and decline of trade unions; the need for a reinvigorated mass movement of workers to fight back against bosses. We leave off where the next and final 1913 Unfinished Business podcast will pick up – how can workers organise today to meet the challenges we face? Contributors: Moira Murphy, Fiona Dunkin, Ronan Burtenshaw, Shane Fitzgerald, Eoin Griffin and Jen O Laoire. Produced by Moira Murphy and Thom MacDermott. With thanks to John Cunningham and Connolly Books.